A well presented five bedroom house located in this highly regarded town-centre location. Wherwell Road is a short walk of the mainline train station as well as all the amenities of the town. The North Downs is conveniently located at the end of the adjoining road. The property has been tastefully modernised throughout whilst retaining many of its original features. Likely to have been constructed in the late 19th Century, the property is a classic example of Victorian architecture. The accommodation comprises: entrance hall, principal reception room with decorative fireplace, dining room with double doors opening onto the terrace and garden beyond, high specification fully fitted kitchen which is open to a dining/breakfast area, ground floor cloakroom. 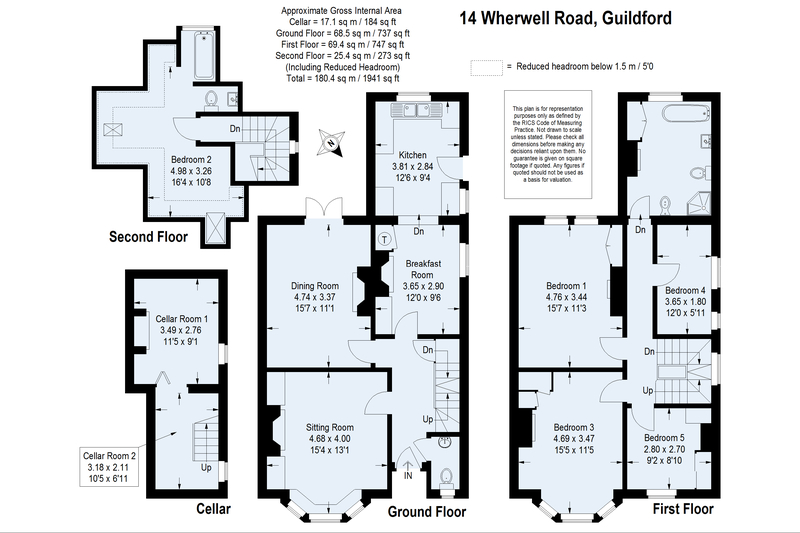 On the first floor there are four bedrooms and a particularly spacious family bathroom (with separate shower). On the second floor there is a further bedroom with its own bathroom. To the rear the property has a lovely sunny garden and a shed for storage. The property also has the benefit of a cellar (please note that this is only for storage). The ever popular Guildford County School is located directly behind the property on Farnham Road, placing it within the catchment area. This property is in Council Tax Band F, with an annual charge of £2,724.06.